Wearable electronics are likely the next evolution of our portable devices, transforming them into compact, lightweight, body-worn gizmos that will allow us to perform many of the tasks we now take for granted: electronic communications, navigation and more. For now, wearable electronics are still relatively bulky in form — such as bracelets and smart watches — and restricted to simpler applications like monitoring your workout or made for pairing up with a more powerful smartphone. Yet, we’re seeing more examples of prototypes that point to thinner, near-invisible wearables, such as this flexible, breathable nanomesh that can relay electronic signals, without the need for a substrate to connect the electronics over the skin. In a paper published earlier last month in “Nature Nanotechnology,” a team of researchers from the University of Tokyo, the Japan Science and Technology Agency, and Riken describe how they created this ultra-thin mesh using gold as a conductor, laid directly over the skin using an innovative laminating process. According to the team, the technology could offer a more comfortable alternative in health monitoring applications, where patients can forego conventional electrode-based systems that might use messy liquid gels, or dry electrodes that have low skin connectivity and poor conductivity. The team’s research found that people could wear the gold nanomesh for up to a week, with no discomfort or skin irritation, which can occur with regular, on-skin sensors. 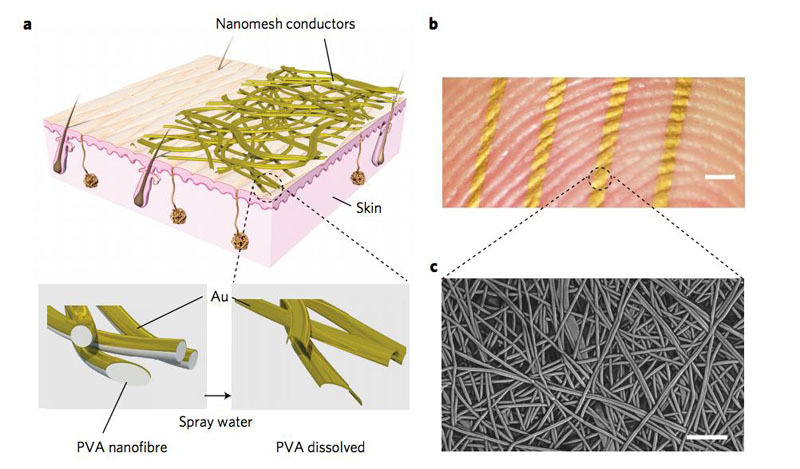 The team’s mesh was created by using electric force to draw together charged biocompatible polyvinyl alcohol (PVA) nano-sized fibers — a process known as electrospinning. These fibers are then woven into a mesh and coated with a layer of gold 70- to 100-nanometers thick. This mesh is applied to the skin, and water sprayed on it to dissolve the PVA, leaving behind a thin layer of adhesive that keeps the gold component in place. By using this method of lamination, the team created a wearable component that was not only flexible but also allowed air to pass through, while still melding with any variable features like wrinkles in the skin. The team found that the nanomesh could stretch up to 40 percent of its original size and continuously flexed for over 10,000 times, and still function normally. The resulting interface is more comfortable and less irritating compared to conventional electrodes that use adhesives and can be simply washed off when no longer needed. The team then tested the nanomesh’s conductivity by hooking it up to a fingertip sensor and a modified glove made of an e-textile, outfitted with a battery and wireless unit that communicated with a laptop computer. Using this setup, they found that the nanomesh could broadcast electrical signals about touch, temperature, and pressure. The team also discovered that the mesh could detect and record the electrical signals from muscle movements. The nanomesh could be an ideal replacement for current versions of long-term health monitoring gadgets that may use films or adhesives that are lightweight but don’t allow the skin to breathe, causing adverse dermatological reactions. The only hitch might be finding a less costly alternative to the gold found in this mesh prototype, making it possible to produce cheaper but durable on-skin electronics. But one might imagine this type of nanomesh device becoming a more even longer-wearing device, a wireless wearable that might not only help monitor the health of the ill or infirm without restricting their mobility but potentially developed further into a new kind of bioelectrical interface that is breathable, flexible and so comfortable you might forget it’s there. Feature image: University of Tokyo.